Get the latest news, articles, opportunities, events and more delivered to your inbox! Sales Numbers- What are you going to do about them? Sales Leads — CRMs or just a spreadsheet? 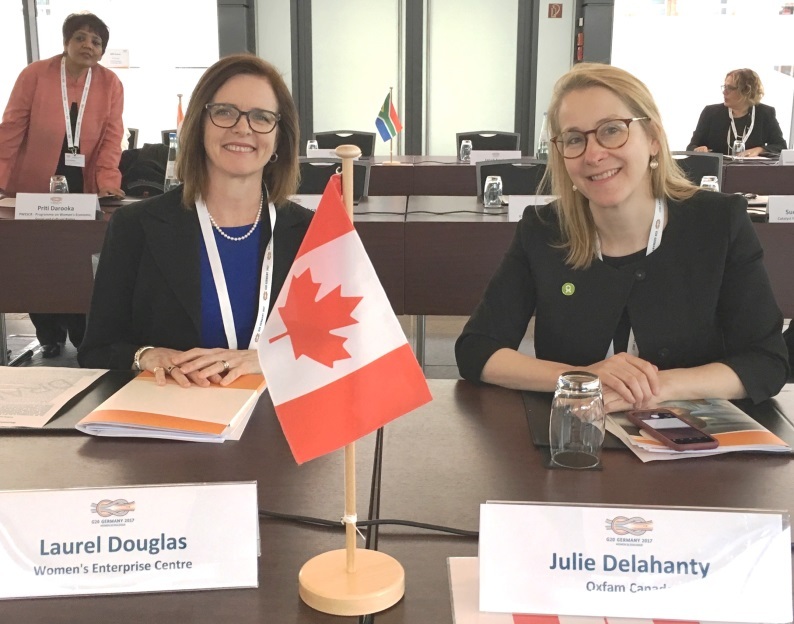 Laurel Douglas, CEO of Women’s Enterprise Centre and a director of Women’s Enterprise Organizations of Canada (WEOC), was part of the two-person Canadian delegation at the 2017 Women20 Summit in Berlin, Germany in late April. WEOC is Canada’s only national organization dedicated to supporting women entrepreneurs, and the authority on women’s entrepreneurship in Canada. Douglas is pleased to support Canada’s important role at the W20, and ensure that the interests of Canadian women entrepreneurs and women in business are represented. The W20 is the newest permanent engagement group of the G20, established in 2015. It was created to help advance women’s economic empowerment in G20 countries and beyond, by helping identify common priorities and encourage gender perspectives within the entire G20 process and the other G20 engagement groups. WEOC has been invited to the W20 every year since its inception. This is the second W20 summit which Douglas has attended on behalf of WEOC. The other Canadian representative attending the 2017 W20 was Julie Delahanty, Executive Director of Oxfam Canada. This year’s W20 was focused around three major themes: labour market, digital and financial inclusion for women, which involves supporting women entrepreneurs to start and scale, build capacity, and have equal access to finance, markets and global value chains. As part of the W20 summit, there was also a conference featuring several high level panels. Chancellor Merkel addressed the conference on three separate occasions, showing her commitment to enhancing women’s economic empowerment in the G20 countries and worldwide. Other speakers included Minister Manuela Schwesig of Germany, Christine Lagarde of the IMF, Minister Chrystia Freeland of Global Affairs Canada, Ivanka Trump, Advisor to the POTUS, and Anne Finucane, Vice Chair of Bank of America and Inez Murray, of the Global Banking Alliance for Women. The W20 Communique and Implementation Plan were presented to German Chancellor Angela Merkel at the end of the Summit. Chancellor Merkel pledged to present the recommendations to her counterparts at the G20 Leaders’ Summit and help ensure that the priorities get acted upon. As reported in an article on the official German G20 website, Angela Merkel will be doing so ‘with great enthusiasm’. The article notes that the “Chancellor pointed out that the leaders of G20 member states have realised that the empowerment of women is an essential cross-cutting issue and an important area for the future of the G20 states”. At the event, a fund to support women-led ventures in developing countries was announced. It will be managed by the World Bank, and several G20 nations will be contributing to it, including Germany, the US and Canada. During the gala dinner hosted by Chancellor Merkel, Canada’s Global Affairs Minister, Christia Freeland, stressed to Canadian delegates the importance for Canada to retain a strong presence at the Women20 summits. She encouraged the delegates to continue attending these meetings, to help demonstrate Canada’s commitment to women’s economic empowerment. The 2017 Women20 Summit was considered a definite success and step forward in helping the goals of the W20. As Australian delegate, Susan Harris Rimmer describes in an article posted by The Interpreter for the Lowy Institute for International Policy, the summit was remarkable for several reasons, one of which is the strong support of the German Chancellor and President of this year’s G20. Through WEOC’s continued presence at the W20, women business owners across Canada and the organizations that support them throughout the ecosystem will continue to learn firsthand about the international initiatives to help with the economic empowerment of women. In addition, several new alignments were forged with other national women’s enterprise organizations, which will help open further opportunities for Canadian women exporters, which is a continued focus for WEOC member organizations. Women’s Enterprise Centre is a non-profit organization devoted to helping BC women launch, lead and scale their own businesses. Our full range of services includes business loans up to $150K, business advice, skills training, mentoring, resources and a supportive community to help women entrepreneurs realize their business potential. Connect with us today for personalized support for your business!